The first Android 2.0-equipped smartphone will arrive on the largest wireless carrier in the U.S. next week, Verizon officially announced Wednesday. The news also coincided with the unveiling of Google's free Maps Navigation service, which will be a part of all Android 2.0 devices. The Droid has a 3.7-inch screen with a width of 843 pixels. It is equipped with the Google Android mobile operating system, has a slide-out hardware keyboard, and can multi-task applications. It is the first in a line of Android-based handsets that Verizon hopes will compete with the success of the iPhone, exclusive to rival carrier AT&T. The hardware is said to be slightly thicker than an iPhone 3GS. Internally, it runs a quick TI OMAP3430 processor. It will cost $199 with a two-year contract. "Were proud to work with Verizon Wireless and Google on the first smartphone to feature Android 2.0," said Sanjay Jha, co-chief executive officer of Motorola and chief executive officer of Motorola Mobile Devices. "Droid by Motorola delivers a rich consumer experience with warp-speed Web browsing, a mammoth screen, and Motorolas expertise in design and voice quality. 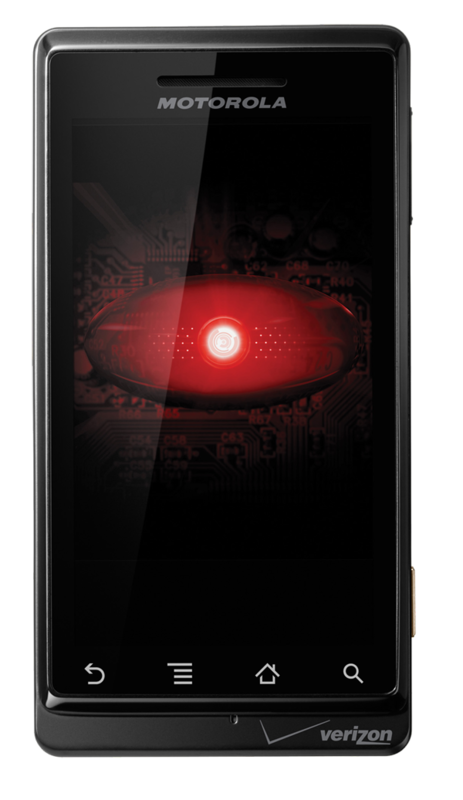 Combined with Android's open, flexible graphical user interface and the power of Verizon Wireless' 3G network, Droid is a smartphone that simply doesnt compromise." During Apple's quarterly earnings call last week, executive Tim Cook said that he believes the iPhone remains multiple steps ahead of its competitors. Other platforms, he said, are still trying to catch up with the first iPhone launched in 2007. Motorola has become aggressive in targeting the iPhone with its Droid advertising. A TV spot released last week mimics Apple's advertisements and product names with statements like "iDon't have a real keyboard" and "iDon't run simultaneous apps." The Google Maps Navigation service, a part of the Droid and Android 2.0, was also unveiled Wednesday. The beta mobile application will offer 3D views, turn-by-turn voice guidance and automatic rerouting. "Unlike most navigation systems, Google Maps Navigation was built from the ground up to take advantage of your phone's Internet connection," the company said. The service will allow users to search by voice, offer live traffic updates, and integrates with the Google Maps satellite view and Street View. It also features a special user interface enabled when the hardware is hooked in to a car dock.